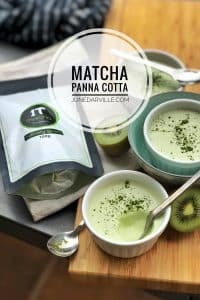 Matcha Green Tea Panna Cotta Recipe | Simple. Tasty. Good. Are you familiar with green tea? 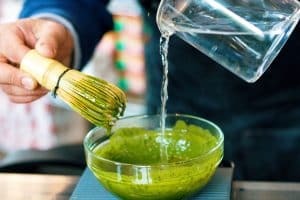 What do you know about matcha? I’m sure that matcha rings a bell somehow. Maybe you’ve tried a matcha latte before? So what do you think of matcha green tea panna cotta? 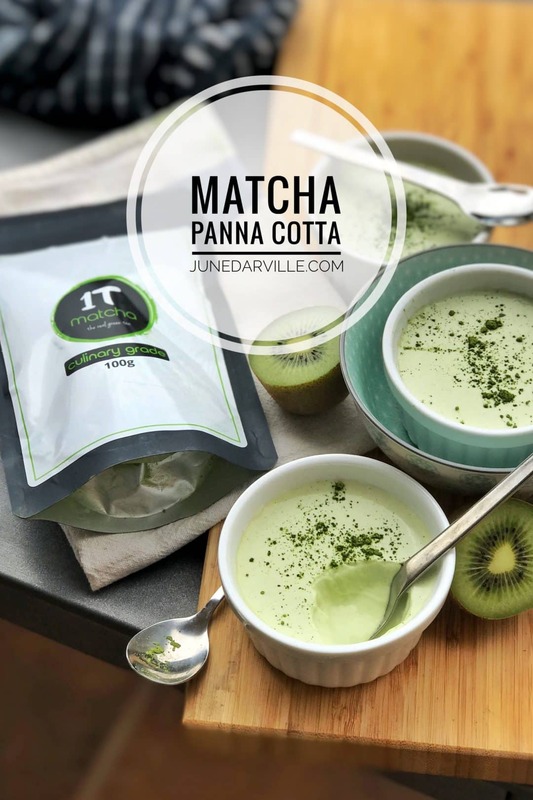 A few weeks ago I received an email from 1Tmatcha, asking whether I would like to try out their premium Uji matcha and create a few recipes with it. Of course! A few days later a package arrived, containing 2 containers of matcha tea. Now let me tell you, I’m a huge fan of matcha green tea! Especially after visiting Japan a few years back. I fell hard for their matcha latte. Probably had one every single day of our trip. And you wouldn’t even believe how many foods and dishes I’ve come across that contained matcha! Matcha sorbet, cake, pastries, soups, candy, waffles, pasta… even chocolate! And yes, I’ve tasted them all. But I never cooked with matcha before to be honest. I like a good culinary challenge so roll up your sleeves and learn! The very first recipe idea that popped into my mind was one of my classic desserts: panna cotta! So matcha green tea panna cotta it is. Let’s get cracking. Like I said I received 2 packages of matcha: one matcha latte for drinks and the other one is a culinary grade, perfect to cook with. Needless to say that I used the culinary grade matcha to make my matcha green tea panna cotta. My panna cotta recipe below is very straightforward. Very simple ingredients. What I do want to talk about is how the matcha will react once you add it to the warm cream mixture. First of all: sift the matcha. If you then add the matcha all in one go to the cream, you will end up with little green lumps, no matter how well you whisk it. That’s why you have to dissolve the matcha in a little bit of warm milk and then add this back to the pan. Do you still end up with little green specks? You can give your warm matcha cream one last firm blitz treatment using an electric mixer – right before you add the gelatine. By doing that your panna cotta will have this impeccable pale green color, just like the one in my picture. I let the matcha green tea panna cotta chill in the fridge overnight. The next day the hubs and I tasted it. Holy mackerel. The flavor was absolutely to die for! It’s creamy, smooth, flavorful, light and refreshing. Spectacular. What wowed me the most though was the subtle zesty taste the panna cotta had. I didn’t add any lemon or lime juice, which made me realise that it could only be the matcha that adds that fresh and herby edge. You can serve the panna cotta in its ramekin, or flip it over and serve it on a plate. Here’s how you can do that best: run a sharp knife around the edge of the set panna cotta to loosen it a little. Then warm a little water in a saucepan and place the ramekins in it for just a couple of seconds. If you leave it in the warm water for too long, your panna cotta will become runny again. Place a plate on top of the ramekin and flip it over. If the panna cotta isn’t moving, put it in the warm water again for just a handful of seconds and then try again. Finish your matcha green tea panna cotta with a light sprinkle of sifted matcha. Don’t exaggerate though. I couldn’t be more happy with the way the matcha green tea panna cotta turned out! Now I’m stoked and wanting to make more recipes with it. 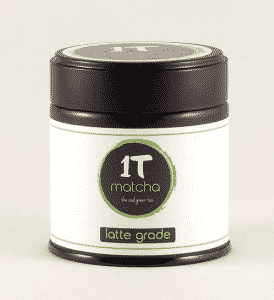 I’ll be doing a latte this weekend with the latte grade matcha! I’m also thinking about baking a cake, making a quick mug cake or even matcha pancakes. And how about making a matcha crust on a fresh piece of salmon? Lots of ideas. Stay put for more recipes I’d say! Love matcha? 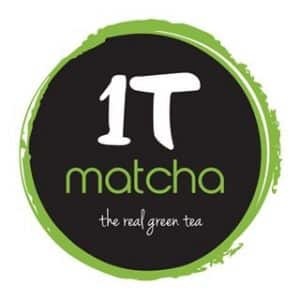 Then go get your own stash of this premium Uji matcha at 1Tmatcha right now! 1) Combine the cream and milk in a small saucepan. Place it for about 6 minutes over medium-low heat until simmering. 2) Stir regularly. In the meantime soak the sheet of gelatin in cold water for a few minutes. If you're using granulated gelatin, then skip this step! The gelatin will become soft after 3 minutes. 3) Remove the warm cream and milk mixture from the heat. 4) Add 3 tbsp of the warm cream mixture to a small cup and quickly stir in the 1Tmatcha green tea. 5) Then return the matcha mixture back to the pan. Also add the sifted sugar. 6) Stir well to avoid any lumps. Also add the soaked gelatin (or granulated gelatin) and yogurt. 7) Stir the cream well. Now pour the warm panna cotta into lightly oiled glasses or ramekins. 8) Chill the panna cotta for at least 8 hours (preferably overnight) in the fridge until set fully. Serve the panna cotta in its ramekin or flip it over on a plate. 9) Finish with a light sprinkle of sifted 1Tmatcha green tea.